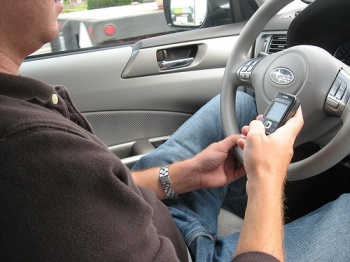 People Use Technology to "Outsource Self-Control"
More and more people are using tech to curb unwanted behavior, such as GPS apps that disallow texting while driving. People have always used technology to make every day tasks easier or to remind you to act in a certain way. The easiest and perhaps earliest example in human history is the alarm clock, but people are now using applications on smartphones to curtail all kinds of things from drunk-driving to Internet usage. As GPS-enabled devices like cellphones and iPods with limitless applications become almost ubiquitous, it makes sense for people to begin using them to regulate daily life. Ann Mack, a "trend-watcher" in the employ of marketing firm JWT, calls it "outsourcing self-control." "The thing is we're becoming more aware of these behaviors, and as a result, we're trying to seek help to circumvent some of our more base impulses," Mack said. "We're bombarded more and more with temptations on a regular basis, and it's getting increasingly difficult to deal with that." So we now have a GPS-enabled application for Blackberry phones called NOTXT thats lock down the texting capability of cell phones when it detects movement of a speed over 10 mph. Another application called Slow Down, predictably, helps drivers stay under a set speed limit. The app plays music and slows down the tempo when you start to go too fast and cut the music off completely if you are more than ten miles over the limit. The devices are made by a company called Intoxalock, and are usually installed in repeat drunk driving offender's vehicles because of a court order, but the company reports that about 1.5 percent of its units are purchased freely. "I know that isn't a lot, but it is growing at a slow, steady pace," a representative from Intoxalock (best company name ever) said. It is certainly a good thing for people to try to take control of their own lives and I like that technology is being put to such good use. I just don't know if I'd like to put more control into the hands of machine. With TV, computers, cellphones and all of our various gaming consoles, don't they rule our lives enough without having to berate me for sending a quick text to my wife as I'm driving home from the bar at 60 mph? Is nothing sacred?